I’m not even sure what a cobb salad is and, in fact, I become a little less certain with each recipe I look up as each one is totally different. Wiki says that it came about in the 1930s at the Hollywood Brown Derby restaurant, where it became a signature dish, named for the restaurant’s owner, Robert Howard Cobb. The legend is that Cobb had not eaten until midnight, when he mixed together leftovers he found in the kitchen, along with some bacon cooked by the line cook, and tossed it with their French dressing. Who knows? I figure if the legend is true than a good cobb salad includes any leftovers in the fridge, typically presented side by side, not mixed, with a good dressing to throw on top. At the height of August, when sweet corn is at its peak, we seem to always have leftover cobs not eaten. They were my inspiration behind this non-authentic vegan version. But in my book, what recipe is 100% authentic anyway? On a platter, spread the fresh cleaned salad greens. Place piles of your veg ingredients on top in nice rows or messy piles. In a small bowl, mix the ingredients for the dressing and stir well until everything is combined. 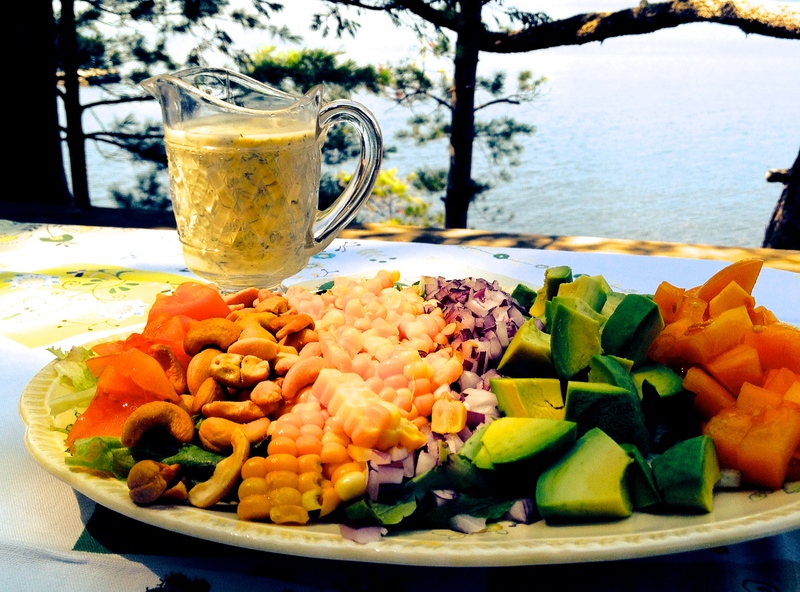 Serve alongside the cobb salad so everyone can add dressing to their liking. This is originally from the Casa Moro Cookbook via Food52, one of my go-to blogs for the recipes and fabulous Provisions store. It’s adapted slightly, from a slight adaptation. Which makes me happy – thinking about all these recipes that travel and get shared and get switched up slightly with each new rendition. My daughter, Rebekah, was my co-chef on this one and decided to add Jimmy Nardello Smoked Paprika from the amazing Vicki’s Veggies. Which is so fitting given the travelling and sharing. Why? Because of Jimmy. Rumour has it that Giuseppe Nardiello and his wife, Angela, nurtured a favourite variety of sweet frying pepper in southern Italy in the region of Basilicata. When they set sail from the port of Naples in 1887, Angela carried a handful of the pepper seeds with her. They settled in Naugatuck, Connecticut, where they raised the peppers, and eleven children. The fourth one was a son named Jimmy. Jimmy was the only one of the Nardello children to inherit Angela’s love of the garden. Jimmy passed away in 1983. But before he did, he donated some of the heirloom pepper seeds to Seed Savers Exchange (SSE) in Decorah, Iowa. SSE specializes in protecting heirloom seeds, with more than 11,000 varieties protected in two separate climate-controlled vaults. One hundred and twenty years after the Nardellos set sail, bringing a small piece of their homeland with them, the pepper that bears the family name is becoming a favourite among chefs and home gardeners nationwide, but it is still registered as “endangered” on Slow Food USA’s Ark of Tastes. The Ark is an effort to find, catalog, and protect the world’s endangered flavours from the onslaught of the standardization of agriculture and cuisine. Crazy, right? Totally. 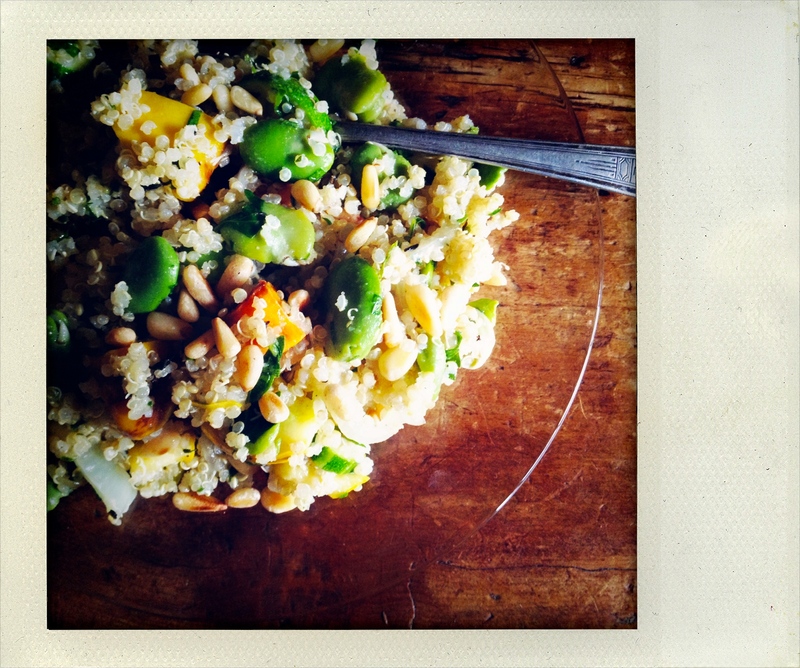 But beautiful and important and poignant and a great addition to this warm winter salad. Toss the squash with the garlic, allspice, smoked paprika, olive oil, and some salt and pepper. Place on a tray, optionally lined with parchment, in the oven for 20 to 25 minutes, or until soft. Remove and allow to cool slightly. While the squash is cooking, make the tahini sauce. Mix the minced garlic with lemon juice and add the tahini. Now thin with the water and olive oil, and check for seasoning. You should taste a balance between the nutty tahini and lemon. 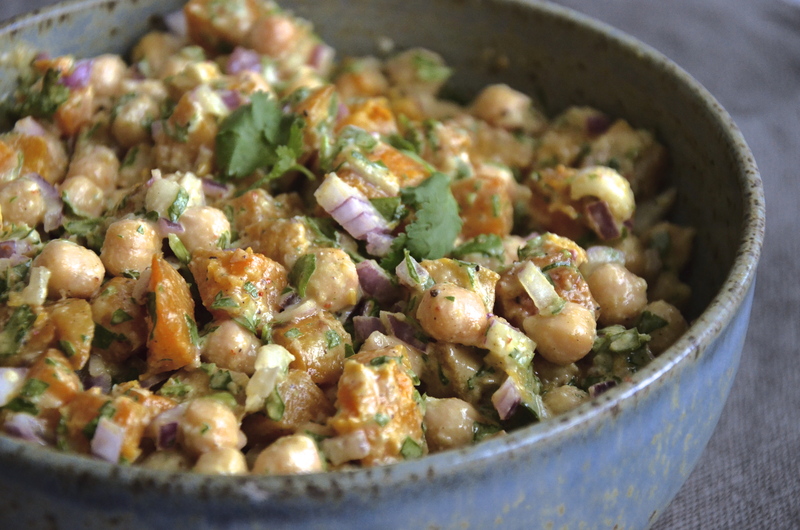 To assemble the salad, place the squash, chickpeas, red onion, and cilantro in a mixing bowl. Pour on the tahini sauce and remaining oil and toss carefully. Season with salt and pepper. Serve. Eat. And say a prayer of thanks to Jimmy. What you probably know is that cabbage is a leafy green plant grown as an annual vegetable crop for its dense-leaved heads and is closely related to other veggies, like broccoli, cauliflower, and brussels sprouts. What you probably don’t know is that cabbage was most likely domesticated somewhere in Europe before 1000 BC and that by the Middle Ages, it had become a prominent part of European cuisine, especially in the wintertime because it’s so hardy. Denmark was no exception. 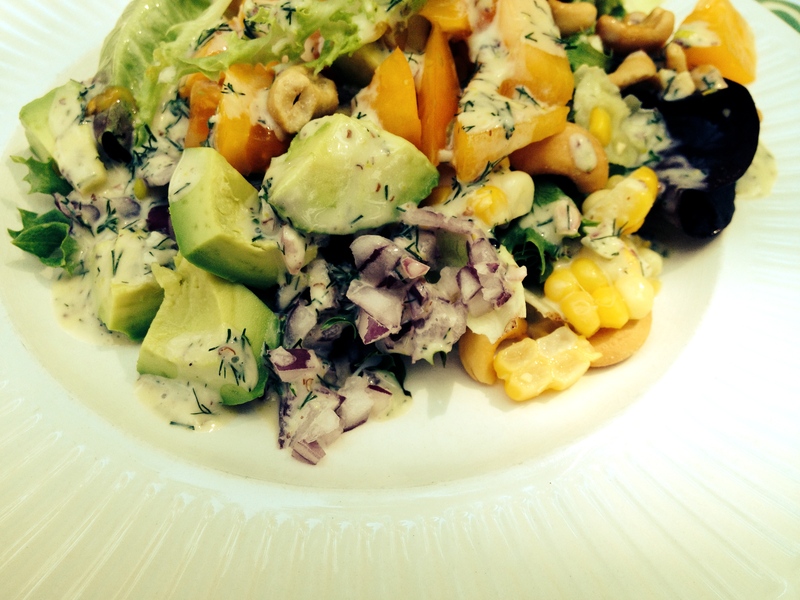 Spidskål is a Danish Cabbage Salad featured by Mikkel Lippman from Copenhagen in the new Kinfolk Table. I used Nappa Cabbage for this recipe which is a Chinese, not Danish, Cabbage with a Japanese name – “nappa” is colloquial term in Japanese referring to the leaves of any vegetable, especially when used as food. So, once again, the world meets in this simple, elegant dish with a crispness from the cabbage, a nuttiness from the sesame seeds, and a tanginess from the dressing. But despite its simplicity – perhaps because of it – it can hold its own on any celebratory table. Toast the sesame seeds in a small, dry skillet over medium-low heat, stirring constantly, for about 5 minutes or until lightly browned. Cool completely. Discard any torn or wilted leaves from the outside of the cabbage. Cut the head in half and discard the core. Finely shred or chop the cabbage, placing it a wide mixing bowl as you work. Sprinkle with salt and pepper. Add half of the toasted sesame seeds. Toss well and set aside. Combine the vinegar and mustard in a small mixing bowl. Gradually whisk in the oil to form an emulsified dressing. 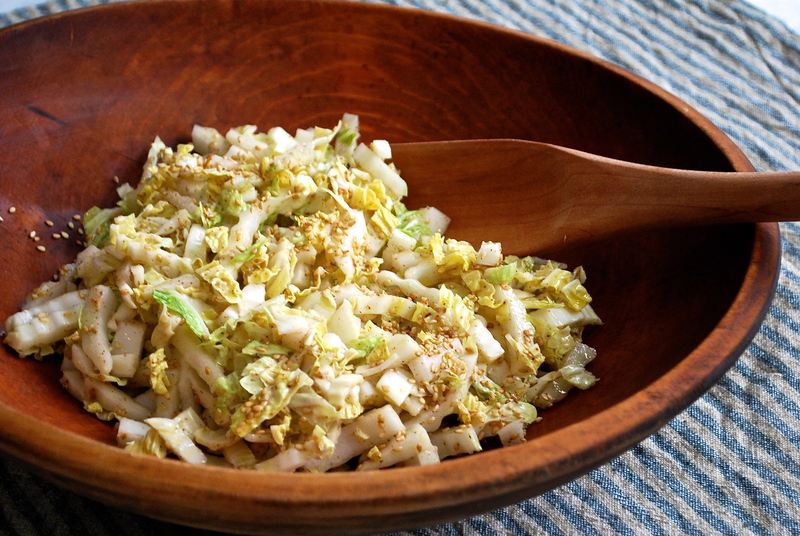 Drizzle the dressing over the cabbage and toss to coat evenly. Transfer to a serving bowl. 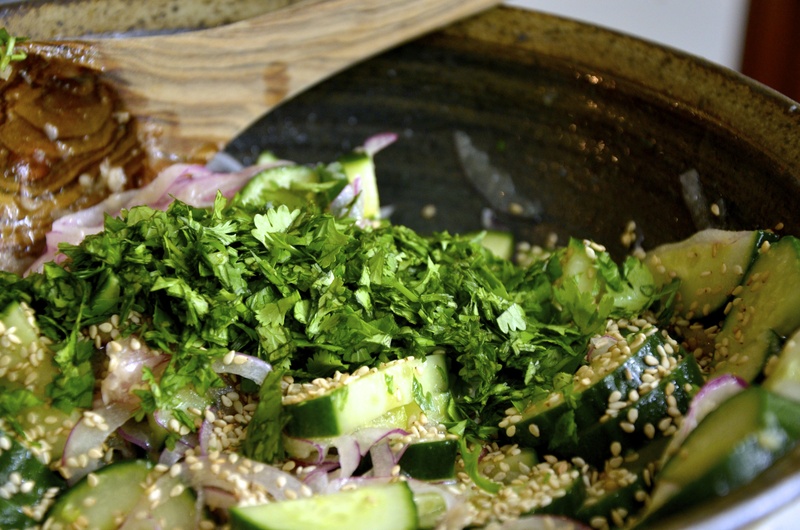 Sprinkle with the remaining toasted sesame seeds. Serve cold or at room temperature. I’m heading to London, England next week and will be dining at the fabulous Ottolenghi’s on Tuesday night. I can’t wait. I use his cookbooks all the time and am very inspired by him. And now I get to feast on his creations prepared by – not by me in my humble little kitchen – but by his peeps. So this recipe is in honour of that occasion. I’ve switched it up a bit but it’s still his signature style using fresh, good quality ingredients in a simple way with heaps of fresh herbs to make it sing. Start by making the oven-dried tomatoes. Preheat the oven to 375 degrees. Quarter the tomatoes vertically and place skin-side down on a baking sheet lined with baking parchment. Arrange the thyme sprigs on top of them. Drizzle over the olive oil and balsamic vinegar and sprinkle with some salt. Roast for 1 hour, or until semi-dried. Discard the thyme and allow to cool down slightly. Meanwhile, place the red onion in a medium bowl, pour over the vinegar and sprinkle with the sea salt. Stir, then leave for a few minutes so the onion softens a bit. Place the lentils in a pan of boiling water (the water should come 3cm above the lentils) and cook for 20-30 minutes, or until tender. Drain well in a sieve and, while still warm, add to the sliced onion. Also add the olive oil, garlic and some black pepper. Stir to mix and leave aside to cool down. Once cool, add the herbs and gently mix together. Taste and adjust the seasoning. To serve, pile up the lentils on a large plate or bowl, integrating the tomatoes as you build up the pile. 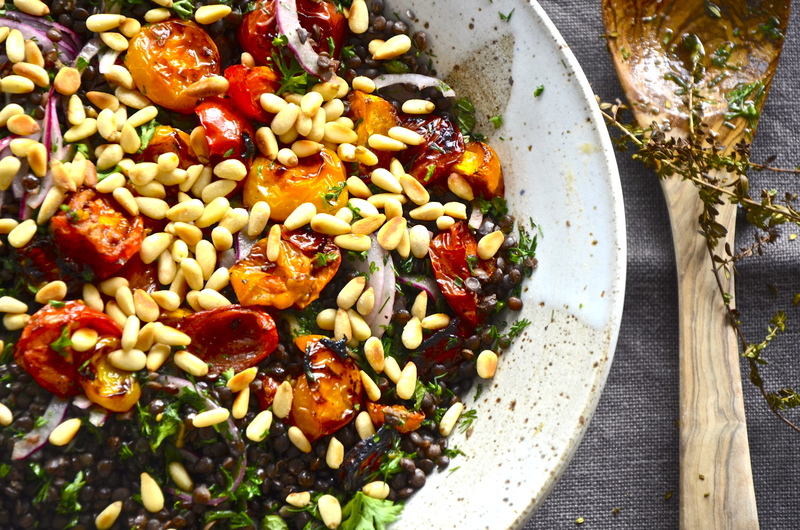 Drizzle the tomato cooking juices on top, sprinkle with the pine nuts, and serve. The farmer’s market is one of my favourite places to go on a Saturday morning. The sunny faces, the fresh produce, the smell of hard work and satisfaction, the chaos of kids and dogs and lazy shoppers. I love all it, but I especially love the potential of what all those local ingredients will become, and the release from decision-making and meal planning. You can go to the market, see what they have, and just prepare what you come home with. Yesterday it was baby zucchini, zucchini blossoms, basil, mint, tomatoes, and thyme. No need to over-think it – just prepare what you’ve got and thank the gods for this season’s bounty. This is a zippy, zingy salad thanks to the lemon zest, with lovely aromatic notes thanks to the fiori di zucca, or zucchini blossoms. And it’s pretty to boot which should never be underestimated; pleasing to the stomach, heart and soul. Place thyme on a cutting board, and bruise with the dull edge of a knife. Place thyme and oil in a small saucepan. Cover, and heat over medium heat until small bubbles appear. Turn off heat, and steep thyme, covered, 20 minutes. Discard sprigs, leaving loose thyme leaves in oil. Whisk together lemon zest and juice and 2 tablespoons thyme oil. 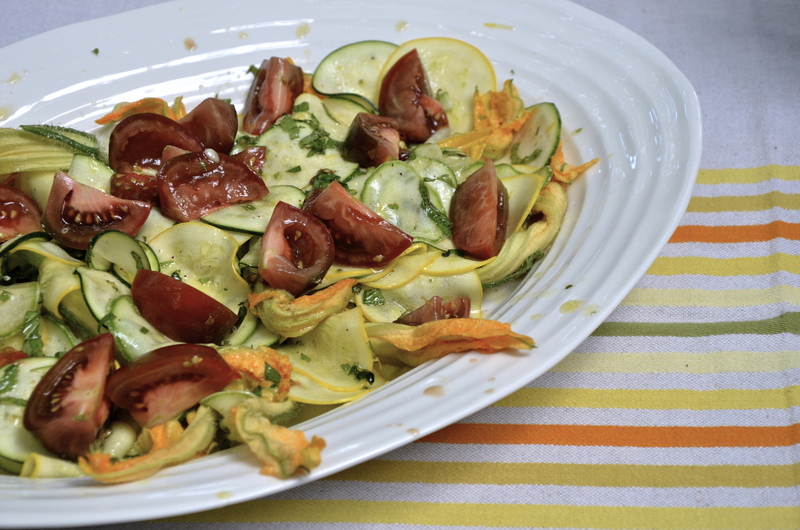 Combine half the dressing with the zucchini, tomatoes, zucchini blossoms, basil, mint, red-pepper flakes, and salt. Season with pepper, and toss. Prepare nicely on a platter. Drizzle with remaining dressing, and sprinkle with little more basil and mint. This is an Ottolenghi special which needs little introduction. It’s refreshing and tasty and a wonderful companion to a mejadra that nourishes the body and soul. Instead of raita for those super-vegans out there, try this a complimentary cucumber side dish. To serve, tip out some of the liquid from the salad (the cukes give up a lot of liquid), then stir. Taste and adjust seasoning and serve beside a heaping portion of mejadra.